My sister saw an idea on Pinterest for some little bug ornaments for the garden using painted golf balls. I loved the idea and her garden looks so sweet dotted with little ladybirds hiding in her planters. They have started to show signs of wear though, with the paint coming off and chipping. As we just had our birthday, I thought I’d make her some more using a slightly different technique and glaze them so they last for her all year, as well as sharing the DIY with you guys. Now you could use golf balls, air dry clay or go with the idea I’m using, which involves a little trip to the beach (though I think I’d wait for slightly better weather here in the UK if I were you!). I picked up a few different sized pebbles, but make sure the ones you choose have round edges, are smooth and not too small. The smaller and bumpier they are, the harder they’ll be to paint but don’t worry about finding a perfect sphere. All you’ll need, along with your stones, is some bright acrylic paints, some different sized paintbrushes and a glazing medium (I used ModPodge – you can find this in places like Hobbycraft or buy it on Amazon). I definitely recommend giving your stones a ‘base coat’. Like a primer, it not only adds durability but also allows the colours you paint to stand out and look brighter. I used white gesso for my base layer, and gave each stone two coats. 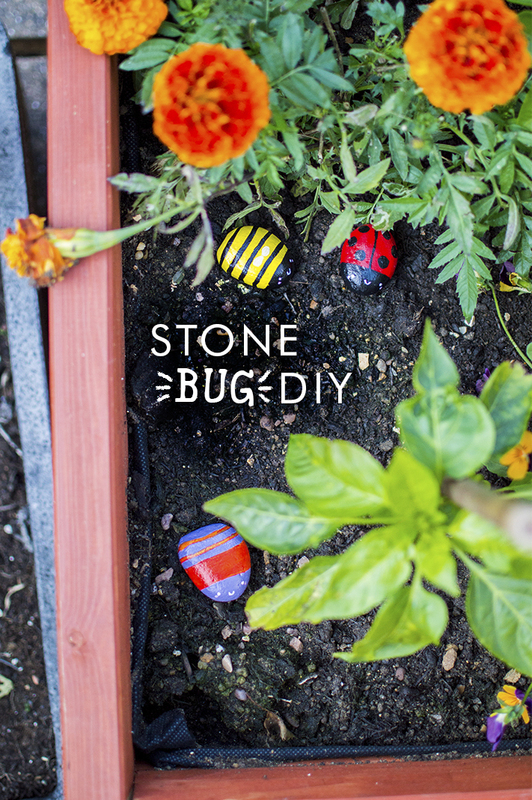 I didn’t use a template because the designs are really simple – definitely something that children can get involved with too (though it might be worth using larger stones in that case!) I created three designs of each, a bumblebee, a ladybird and. well… an unidentifiable but rather fun purple bug thing. The options are pretty endless with a craft like this but I stuck to three designs that are nice and easy, but still look really cute. Use a small to medium size paintbrush to paint your first coat of main colour, (I did two coats for the yellow but only needed one for the red.) The great thing about acrylic paint is that once you’ve finished painting your first coat on all your stones, you can go back to the first one you did and it will be dry already! Use a smaller paintbrush for the finer details – any stripes, dots, wings, antennas etc. you’d like to add. I simply used black or white dots for the eyes and small pink dots for blushed cheeks. To add durability to your little bugs, the final step is glazing. This’ll mean that they won’t weather or get damaged so easily when they’re decorating your planters in the garden. I did one coat using ModPodge and a sponge brush. Not only does it protect your bugs, but it also adds a shine to them and makes them look finished and professional. This really is a three step tutorial – so easy and I think they look great! That’s all there is to it, and if you add them into a gift box on top of some tissue paper they make a great gift. I love seeing them peeking out of the pots when I'm sat on our patio and I'll definitely need to make some more!